The importance of Sandia National Laboratories is evident in its mission of "ensuring the U.S. nuclear arsenal is safe, secure, reliable and can fully support our nation's deterrence policy." More than 130 OSU alumni work for this U.S. Department of Energy/National Nuclear Security Administration laboratory that also supports federal, state and local government agencies, companies and organizations. Among them is 1976 electrical engineering graduate Bruce Walker, the vice president of weapons engineering and product realization. "We have a very significant responsibility for the nuclear-weapons program, being responsible for all of the non-nuclear components as well as the overall system integration and the engineering that goes into a weapon system," Walker says. "One of our requirements is that the weapon never works when it's not supposed to. That would be catastrophic. So we put a lot of effort into the safety, security and control of the systems. At the same time, to have an adequate deterrence, you have to have confidence that it will work if it does need to work." 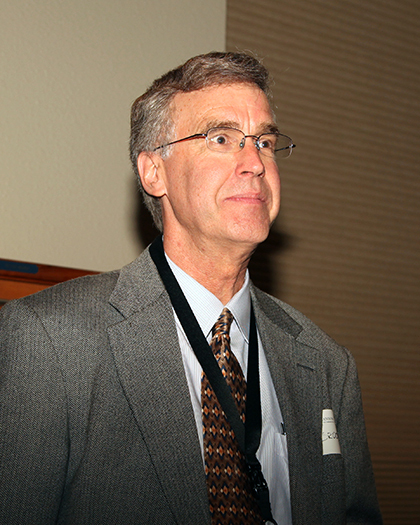 Walker is the third OSU graduate out of the last six people in this crucial position at Sandia's headquarters in Albuquerque, N.M. Heinz Schmitt, holder of a 1966 OSU mechanical engineering doctorate, filled the role from 1995 until retiring in 1998. The following year, the College of Engineering, Architecture and Technology awarded him the prestigious Melvin R. Lohmann Medal, which lauds "contributions to the profession or education of engineers, architects or technologists that merit the highest recognition." 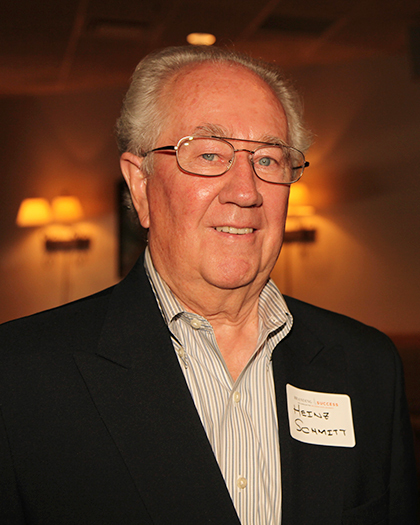 In 2009, Carolyne Hart, who earned a 1976 master's and 1978 doctorate in electrical engineering from OSU, was promoted to Schmitt's former position at Sandia. Walker took over when she retired in 2011. "That vice presidency is responsible for the Sandia portion of the entire stockpile, and that's a very large responsibility," Schmitt says. "And in fact, that person is the chief engineer for Sandia's nuclear weapons business, so it's tough. To have three people from one university selected for that position says a lot about OSU." Walker adds, "It is certainly special. There is a significant amount of pride that it carries. It shows the degree of success that people at Oklahoma State have had at the laboratory." Walker, Hart and Schmitt each surpassed 33 years with the Lockheed Martin Corp. subsidiary that has more than 9,600 regular employees. Long and successful careers at all levels have become a trend among OSU alumni at Sandia. Many people have worked to strengthen the ongoing relationship between the two institutions, resulting in stronger recruiting and research partnerships. 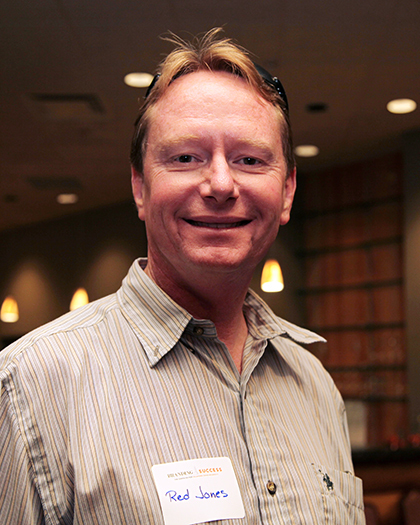 James "Red" Jones, who has a 1984 bachelor's and 1987 master's in mechanical engineering from OSU, is a distinguished member of the technical staff with almost 27 years at Sandia. He is on the organization's OSU recruiting team, which gives him insight into why Cowboys and Cowgirls make such good hires. "One of the things that I see at Oklahoma State that is not always typical at universities is an emphasis, even at the undergraduate level, on student collaboration," Jones says. "Big engineering and big science are about working well with other people. At OSU, you help each other out even though you're competing for a grade. On the job, you're competing for raises or bonuses, but it's more important to collaborate and succeed on the project or program you're working on." OSU President Burns Hargis and Paul Tikalsky, dean of the College of Engineering, Architecture and Technology, visited Sandia's headquarters in August. "We want to thank Sandia for all that it does for OSU," Hargis says. "Our organizations have collaborated on several research projects, and Sandia actively recruits from three OSU colleges and 11 majors." Walker and Schmitt say OSU's practical education prepares graduates for immediate success in the workplace. 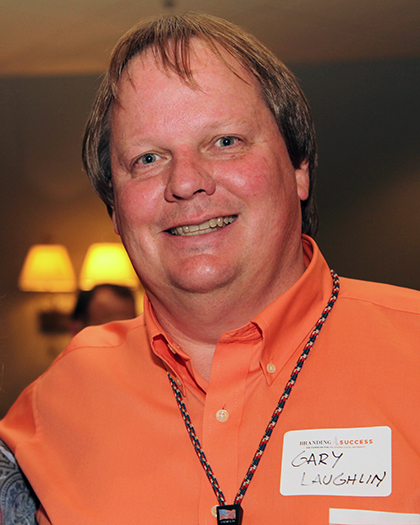 Gary Laughlin, an OSU alumnus with a 1984 bachelor's and 1986 master's in mechanical engineering, is deputy of the systems assessment and research center and head of the OSU recruiting team. Over his 27 years at Sandia, he has noticed many similarities between the two organizations, beginning with their missions. In 1890, Oklahoma A&M College was established to fulfill the land-grant mission of providing a practical education to benefit the public. In 1949, President Harry Truman challenged Sandia to "render an exceptional service in the national interest." "Both institutions are founded in service to the community and to the nation," Laughlin says. "There is also a strong loyalty and patriotic spirit in people from both institutions, so culturally I think the two align very well." Bruce Nguyen, a 2006 business and international business and 2009 MBA OSU alumnus, agrees, adding that there is a special bond among Sandia's OSU alumni. "We are a community within a community ourselves," says the senior strategic contracting representative. "When you get here you kind of learn a whole new language. You talk about where you work at Sandia by just giving a certain five-digit code. You can understand so much about each other and start having a connection." Ben Fine, a 2003 mechanical engineering OSU graduate, points to another reason OSU alumni stay with Sandia: the flexibility to change jobs within the organization. The satellite systems engineer was hired to work on satellite test systems and soon discovered a passion for software engineering. 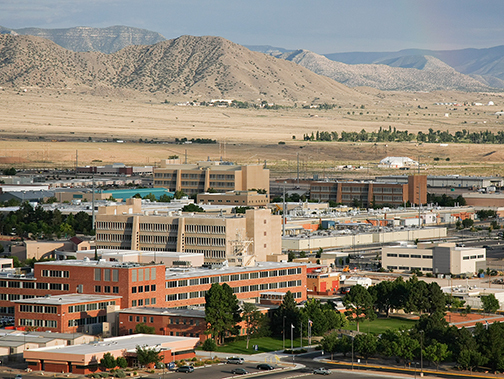 Sandia's primary campus is on Kirtland Air Force Base in Albuquerque, N.M.
"So I worked on database systems and supervisory control software applications," Fine says. "I loved doing that work, so I adjusted my career trajectory to incorporate more software engineering responsibilities along with my systems engineering responsibilities. I've been able to branch out and get my fingers into all kinds of things." Walker notes that the organization's broad range of projects includes defense systems and assessments; energy, climate and infrastructure security; and international, homeland and nuclear security. "If you want to do something completely different in an area of nonproliferation, energy research or international programs, you can move within the company," Walker says. "You don't have to quit, sell your home, move across the country and go work for another company to do something significantly different." Sandia employees enjoy that flexibility, but they consistently cite the organization's mission as the No. 1 reason for their job satisfaction. "We're helping with national security," Jones says. "What we're doing matters to the country." Walker adds, "In my career, I've been able to make contributions to national security that I will remember when I'm 80 or 90 years old. I feel a level of fulfillment that I would not have felt anywhere else."